How many all in world Matusevich? I have tried to answer this question, using the data from electronic directories, mass-media, the Internet, the information given by the State committee on affairs of religions and nationalities of Republic of Belarus, Ministry for Foreign Affairs of RB, other open sources. At once I shall tell, that the given calculation cannot be considered as exact and final. However, with the big share of probability it is possible to assert, that it gives quite objective performance on the given question. Quantity of Matusevich-subscribers of a telephone system in Minsk - 498. Quantity of individual subscribers - 5 %. Average number of family in Minsk, pers. - 3. A level of installation of telephones of Minsk - 95 %. The population of Minsk - 1 million 685 thousand Population of Byelorussia - 9 million 996 thousand. Let's find number of representatives of the Surname in Minsk and we shall divide him into the general number of inhabitants of the Byelorussian capital. 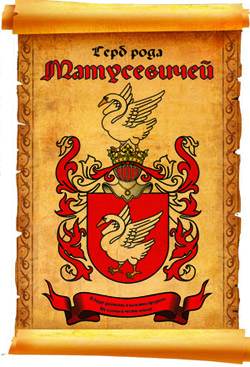 The received factor is applicable for a finding of number of Matusevich, living on territory of Byelorussia (see about migratory processes in section "History"). For calculation of number of representatives of the Surname outside of RB the given factor we shall reduce by 5 % (with the purpose of the account of the various factors working behind borders of RB). In the table the initial data on number of natives of Byelorussia and their descendants living now worldwide, and the received values of quantity of representatives of the Surname are given. Country Number of natives of Byelorussia, thousand pers. . Number of Matusevich, thousand pers. * - The data are specified on the basis of the information given by Andrey Matusevich from Riga. ** - are not taken into account Matuseviches which are not natives of Belarus or their descendants. So, only in Poland approximately 2/3 representatives of the Surname in no way are connected to Belarus and convinced of one's original Polish roots. Thus, in the world lives more than 12 thousand representatives of our Surname.